The missing link has arrived. Skinnyr has been around since 2006. In these 3 years, I've always dreamt of a net-connected scale that would update Skinnyr. Today, I'm happy to announce that dream has not only come true, but has been one-upped. 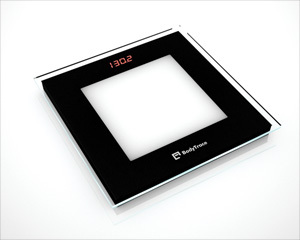 BodyTrace, Inc. has launched their eScale, a net-connected scale that not only updates Skinnyr, but requires no configuration to do so (if you buy through Skinnyr, that is…). When you order your scale, you won't need to do any configuration to get your scale working properly. As soon as you unwrap it and step on it, your weight will be uploaded to BodyTrace's website. In addition, if you purchase through Skinnyr, your Skinnyr account will be linked up, meaning your weight will be updated on Skinnyr as well. You can optionally set up your Skinnyr account separately after purchase, as well. That's it, really. I don't know about you, but I'm a bit lazy (thats how I got fat to begin with! ), so the simplicity of this scale appeals to my inner couch potato.